The 1km bus and cycle-only route between the University of the West of England (UWE) and Abbeywood Roundabout in Stoke Gifford is set to improve journey times and reduce delays by allowing buses to bypass traffic on the Ring Road and Coldharbour Lane. 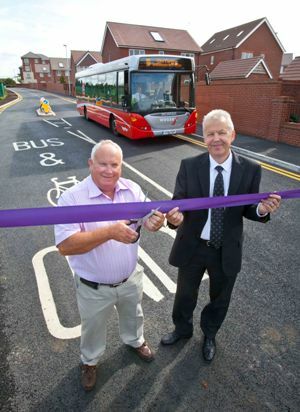 The link will also connect residents of the new Cheswick Village development into the area’s public transport network and provide a vital link to the proposed Romney Avenue Bus Link, south of Cheswick Village, combining to form a direct, bus only route between the North Fringe and Bristol. The link can be used by pedestrians and cyclists and incorporates an automatic bus barrier to allow controlled access of buses onto the UWE-owned section of the link at the rear of the University campus. Chair of South Gloucestershire Council’s Planning and Transportation Committee Cllr Brian Allinson said: “I’m delighted to be opening another link in our area’s public transport network, helping improve services for bus users and reducing congestion on our roads. “This route builds on the Greater Bristol Bus Network infrastructure and will complement other schemes such as the Great Stoke Way bus lane and the Abbeywood Roundabout improvements. The £1.5m link was funded from South Gloucestershire’s Capital Programme, including £1.2m of developer funding and a further £300,000 from South Gloucestershire Council’s Local Transport Plan programme.